None of the supports were from Brighton, so I’ll rattle through them quickly – Dogtooth are the new project from Shrag’s original Canadian drummer Leigh Anne Walter, who’s teamed up with singer-songwriter Kate Gerrard, and the Metatrons were like a day-glo version of Shrag. If you didn’t know that co-Headliners Tunabunny were from Athens, Georgia you could have guessed from the opening song which sounded an awful lot like one of their hometown’s most famous bands (and I’m not talking about the B52s here). Over the course of their set though they ended up sounding a lot more like the Breeders, and that was no bad thing at all. Shrag arrived onstage later than advertised, which is kind of inevitable with four bands on the bill, and wasted no time in treating the audience to a set which was mainly made up of tracks from the upcoming album, with only a handful of tracks from 2010s Life! Death! Prizes! Last month, Shrag posted up a new track called Chasing Consummations which hinted that the band might be maturing a little – while they might be developing on their recorded output, live they were still just as full of energy, and the banter inbetween songs was anything but mature. After forty five minutes which had me sold on the new album, the band were off, without an encore. 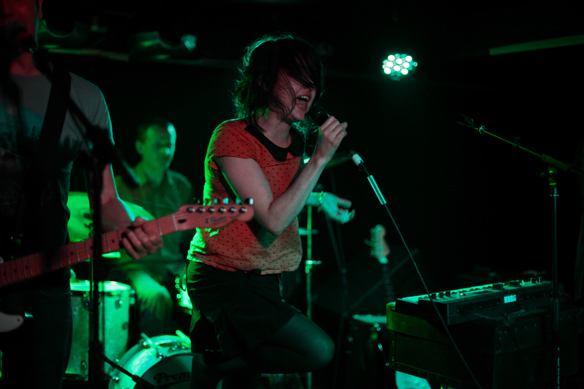 This entry was posted in Uncategorized and tagged Blog, Brighton, Dogtooth, Frog Bar, Live, Metatrons, Music, Review, Shrag, Sticky Mikes, Tunabunny by brightonmusicblog. Bookmark the permalink. the dj night upstairs was pretty amazing!